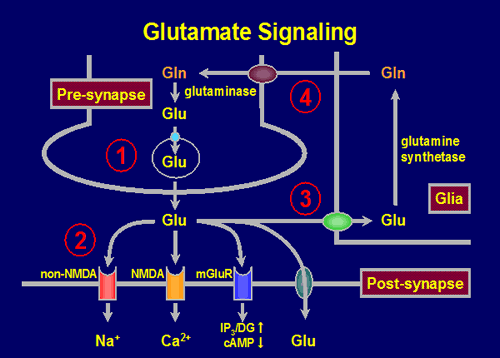 Glutamate is the main excitatory neurotransmitter of the nervous system participating in several important physiological processes such as the development of plasticity, memory and learning, as well as in several pathologies such as epilepsy, cerebral ischemia, Parkinson’s and schizophrenia. Glutamate is synthesized in the cytoplasm and stored in vesicles by a capture system dependent on an electrochemical gradient. It is usually released by exocytosis into the synaptic cleft, where it binds to the glutamate receptors to originate the action potential. The glutamate transporters are responsible for ending the action of glutamate and maintain extracellular levels below the levels that cause neurotoxicity. The study in laboratory animals gives us the possibility of obtaining a more homogeneous set of results, which allow to establish mechanisms that are then useful for the diagnosis and treatment of patients. VULNERABILITY DUE TO POSTNATAL STRESS REPEATED IN ADULT RATS. POSSIBLE EPIGENETIC ALTERATIONS. There are evidences that argue that stress in early stages of development can cause alterations that result in dysfunctions in adulthood. We propose to investigate the epigenetic changes induced by repeated exposure to stress in early stages of development and their participation in the susceptibility to deleterious effects stimulated by exposure to a new stress in adulthood. We will study if the altered susceptibility can be due to modifications in the glutamatergic transporters (TGlu) and neurotrophins. It is also proposed to evaluate the influence of a treatment with deacetylase inhibitors in the early stages of development in order to reduce or eliminate deleterious effects. The optimization of said treatment will be studied applying nanotechnological strategies in order that the administration and bioavailability of deacetylase inhibitors are adequate. Our hypothesis is that TGlu suffer alterations in the hippocampus and in the prefrontal cortex and that they could constitute a good marker of susceptibility to the effects of chronic postnatal stress. Our objective is to determine if the consequences of chronic postnatal stress on epigenetic mechanisms regulate the expression of TGlu and neurotrophins. It is planned to identify epigenetic marks that allow predicting the vulnerability of stress in adult life, which would enable the establishment of early therapies that reduce the appearance of physiopathological and behavioral disorders in adult life. Open-angle glaucoma affects approximately one million people in Argentina and is the second leading cause of blindness in the world. This ocular dysfunction is characterized by the progressive loss of visual functions, which correlates with the death of retinal ganglion cells and papillary excavation with atrophy of the optic nerve head. The increase in intraocular pressure (IOP) plays a causal, though not necessarily exclusive, role in glaucomatous visual loss. In fact, although the decrease in IOP is currently the therapy of choice, in many cases the visual dysfunction persists or even progresses after its restoration to normal values. It has been suggested that various mechanisms such as glutamate-induced excitotoxicity, increased levels of nitric oxide (NO), oxidative damage, neurotrophin deficiency or inflammation are involved in the glaucomatous apoptotic cascade, significantly contributing to the progress of disease. In this context, our objective is to develop an innovative nanotechnological system that includes a conventional drug that decreases IOP and a neuroprotective substance in order to improve bioavailability, decrease the dose, the frequency of administration and the cost of treatment for the optimization of the Treatment of open angle glaucoma. Cadmium (Cd) is an environmental toxic that adversely affects biological systems in various ways. It is a pollutant that is generated from industrial activities, is present in food and is one of the main components in cigarette smoke. Biosorption is a technology that represents an alternative to conventional treatments of heavy metal recovery in water. This technology allows the reuse of waste from agricultural and industrial processes such as rice husk, pine sawdust and citrus peel. Our objective is to remove Cd through the use of chemically modified bioadsorbents from citrus residues of high availability in the province of Entre Ríos and to evaluate the toxicity of Cd in experimental animals since this metal would modify the activity and expression of glutamate transporters and Hill at the level of the hippocampus and the frontal cortex, and would produce an increase in oxidative stress in these areas, causing an alteration in learning and memory processes. (22) Pr enatal stress and its effects of human cognition, behavior and psychopathology: a review of the literature. Ramborger ME, Zorrilla Zubilete MA, Acosta GB. Pedriatric Dimention 3(1): 1-6. 2018. (20) Nicotine-induced molecular alterations are modulated by GABAB receptor activity. Varani AP, Pedrón VT, Aon AJ, Höcht C, Acosta GB, Bettler B, Balerio GN. Addict Biol. 23(1):230-246. 2018. (18) Development of a Drug Delivery System Based on Chitosan Nanoparticles for Oral Administration of Interferon-α. Cánepa C, Imperiale JC, Berini CA, Lewicki M, Sosnik A1, Biglione MM. Biomacromolecules. 18 (2017) 3302-3309. (17) Introductory letter from the Guest Editors. Acosta GB, Poderoso JJ.Pharmacol Res. 2016 (109) 1-2. (16) Long-term effects of early life stress exposure: Role of epigenetic mechanisms. Silberman DM, Acosta GB, ZorrillaZubilete MA. Pharmacol Res. 2016 (109) 64-73. (15) Argentinean Society of Experimental Pharmacology: Brief History and main scientific contributions to the discipline. Sánchez Bruni SF, Acosta GB. Pharmacol Res. 2016 (109) 4-11. (14) Dermatan sulfate / chitosan polyelectrolyte complex with application in the treatment and diagnosis of vascular disease. Yanina RR*, Imperiale JC*, Lazzaro-Martinez JM, Sosnik A, Calabrese GC. *Equal contribution. Carbohydrate polymers. 2016 (144) 362-370. (13) Mucoadhesive thermo-responsive chitosan-g-poly(N-isopropylacrylamide) polymeric micelles via a one-pot gamma-radiation-assisted pathway. Sosnik A, Imperiale JC, Vázquez-González B, Muñoz-Muñoz F, Burillo G, Cedillo G, Bucio E. Colloids and Surfaces B: Biointerfaces.2015 (136) 900-907. (12) Cyclodextrin complexes for treatment improvement in infectious diseases. Imperiale JC, Sosnik A. Nanomedicine (Lond.). 2015 (10) 1621-1641. (11) Novel protease inhibitor Nanoparticle-in-Microparticle Delivery System leads to a dramatic improvement of the oral pharmacokinetics in dogs.Imperiale JC, Nejamkin P, delSole MJ, LanusseC, Sosnik A.Biomaterials. 2015 (37) 383-394. (10) Chronic postnatal stress induces voluntary alcohol intake and modifies glutamate transporters in adolescent rats. Odeon MM, Andreu M, YamauchiL, GrosmanM, Acosta GB. Stress:The International Journal on the Biology of Stress. 2015 (18) 427-434. (9) Production of pure indinavir free-base nanoparticles by a Supercritical Anti-Solvent (SAS) method. Imperiale JC, Bevilacqua G, de Tarso Vieira e Rosa P,Sosnik A. Drug Development and Industrial Pharmacy. 2014 (40) 1607-1615. (8) Nanoparticle-in-Microparticle Delivery Systems (NiMDS): Production, administration routes routes and clinical potential. Imperiale JC, Sosnik A. Journal of Biomaterials & Tissue Engineering.2013 (3) 22-38. (7) Myosin VI Reduces Proliferation, but Not Differentiation, in Pluripotent P19 Cells. Takarada T, Kou M, Nakamichi N, Ogura M, Ito Y, Fukumori R, Kokubo H, Acosta GB, Hinoi E, Yoneda Y. PLoS One 2013 (8) doi: 10.1371/journal.pone.0063947. (6) Novel formulation and drug delivery strategies for the treatment of pediatric poverty-related diseases. Sosnik A, Seremeta KP, Imperiale JC,Chiappetta DA. Expert Opinion on Drug Delivery. 2012 (9) 303-323. (5) The response to postnatal stress: amino acids transporters and PKC activity.Odeon MM, Salatino AE, Rodríguez CB, Scolari MJ, Acosta GB.Neurochem Res. 2010 (35) 967-975. (4) Post-retrieval effects of icv infusions of hemicholinium in mice are dependent on the age of the original memory.Boccia MM, Blake MG, Acosta GB, Baratti CM.Learn Mem. 2006 (13) 376-381. (3) Memory consolidation and reconsolidation of an inhibitory avoidance task in mice. Effects of a new different learning task. Boccia MM, Blake MG, Acosta GB,Baratti CM.Neuroscience. 2005 (135) 19-29. (2) NF-kB transcription factor is required for inhibitory avoidance long-term memory in mice. Freudenthal R, Boccia MM, Acosta GB, Blake MG, Merlo E, Baratti CM, Romano A. Eur. Journal of Neuroscience.2005 (21) 2845-2852. (1) Tolerance to the sedative effect of lorazepam correlates with a diminution in cortical release and affinity for glutamate. Bonavita C, Bisagno V, García Bonelli CC, Acosta GB, Rubio MC, Wikinski SI. Neuropharmacology. 2002(42) 619-625. UBA: Programación UBACYT 2017-2019. Título: Exposición al ruido y al alcohol durante la adolescencia: consecuencias sobre la memoria y correlatos histológicos, bioquímicos y moleculares. Posibles estrategias de neuroprotección”. UBACYT 2014-2017. Período: 1/8/17 a 31/7/ 2019. Directora: Dra. Laura R. Guelman. Investigadora asesora: Gabriela B. Acosta Monto: $ 25.000 por año. Universidad Tecnológica Nacional, Facultad Regional de Concepción del Uruguay: Título: Aprovechamiento de arcillas regionales como materiales adsorbentes para la remoción de metales pesados. Período: 1/1/17 al 31/12/19. Directora: María del Carmen García. Integrante: Dra Gabriela B. Acosta. Prof. Dr. Yukio Yoneda. Professor Emeritus. Laboratory of Molecular Pharmacology. Institute of Medical, Pharmaceutical and Health Sciences. Kanazawa University Graduate School. Kanazawa 920-1192. Japan. Prof. Dr. Kiyokazu Ogita, Department of Pharmacology, Faculty of Pharmaceutical Sciences, Setsunan University, 45-1 Nagaotoge-cho, Hirakata, Osaka 573-0101. Japan. Prof. Dr. Nobuyuki Kuramoto, Department of Pharmacology, Faculty of Pharmaceutical Sciences, Setsunan University, Hirakata, Japan. Prof. Dr. Vladimir J Balcar. School of Medical Sciences (Anatomy and Histology) and Bosch Institute Anderson Stuart Building F13, Sydney Medical School, The University of Sydney NSW 2006. Australia. Prof. Dr. Jorge Manzanares Roble. Instituto de Neurociencias, Universidad Miguel Hernández-CSIC, Avda. de Ramón y Cajal s/n, San Juan de Alicante, 03550 Alicante, Spain. Prof. Dra. Laura Guelman. Investigadora Independiente CONICET. Lab de Biología de la Reproducción en Mamíferos, CEFYBO (CONICET-UBA). 1ª Cátedra de Farmacología, Fac de Medicina, UBA. Prof. Dra. María del Carmen García. Profesora de la UTN, Facultad Regional de Concepción del Uruguay. Entre Ríos. Argentina.jos Prácticos 1º Cátedra de Farmacología, UBA. Laboratorio de Biología de la Reproducción en Mamíferos, Centro de Estudios Farmacológicos y Botánicos (CEFYBO)-CONICET-UBA.